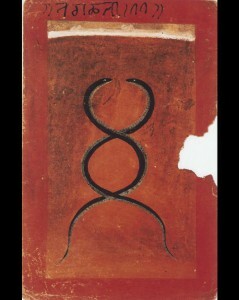 KUNDALINI SERPENTS – The two serpents intertwine as a symbol of the relationship between two opposites: the sun and the moon, on the cosmic level, and within the sacred physiology of the subtle body, the solar nadi and lunar nadi, as they are described in the texts of Tantric Hinduism. The opposites manifest themselves in the cosmos and within the individual psyche, and they reflect the complementary aspects of the divinity, out of which all things flow. The two snakes in this image represent complementary forms of divine energy. The same forms are represented by the sun and the moon, the male and the female, heat and cold. Central in this symbolism is the notion of energy. In the Hindu worldview, the term for this energy is prana, which means “breathing forth.” It may refer to the Ultimate as the transcendent source of all life, to life in general, to the life force of an specific being, to respiration, to air, and to the life organs. It is the creative force that underlies and pervades all being. In this sense, prana is related to the Greek pneuma (“spirit”) and the Melanesian mana (“power”). All of these terms refer to an invisible force that moves and empowers cosmic life. That this energy should be represented in two of its aspects by two snakes is not surprising, since the primary divinity involved in this ritual process is also depicted as a snake, that is, Kundalini. In the West, we tend to symbolize spirit as a bird, especially a dove or an eagle. In this way, we stress the freedom and transcendence of the spirit. However, the snake is also a common symbol for spirit, because it is believed to possess the powers of healing and immortality. Shedding its skin, the snake appears to undergo rebirth. Further, it is believed to have a special connection with the life-giving powers of the earth in which it dwells. In his study of Kundalini, C. G. Jung emphasizes the value that the traditional spiritual disciplines offer the individual during the process of psychological development. The traditions provide both a symbolic context and the techniques necessary for integrating activated unconscious material (dreams, visions, physical symptoms, etc.). In his commentary on Gopi Krishna’s personal experience of the awakening of Kundalini within his own body, James Hillman restates the importance of an ideational context for psychological experience. “To our loss in the West, we are so lacking in an adequate context that we do indeed go to pieces at the eruption of the unconscious, thereby justifying the psychiatric view. Fortunately, Jung’s analytical psychology gives in its account of the process of individuation a context within which these events can be meaningfully comprehended. Fortunately, too, Jung studied as a psychologist this branch of yoga. He called the Kundalini an example of the instinct of individuation. Therefore, comparisons between its manifestations and other examples of the individuation process (e.g. alchemy) provide a psychologically objective knowledge without which there would be no way of taking hold (comprehending, begreifen) what is going on. Very often, therefore, it is of utmost value during a period of critical psychological pressure in which the unconscious boils over, to provide the sufferer with psychological knowledge” (Krishna, 95). The archetype of the Twin Heroes, a balanced, holistic behavioral pattern for men, is central to nearly all New World mythologies.